Wisdom of Life. : I don't need life insurance!!! Is very common to hear this statement from the mother when the children purchase life insurance; "I want my son not the insurance!" Or when the husband buys life insurance for the benefits for the wife, she might say, "I don't need the insurance coz i love my husband." Ignorantly the women think life insurance is a taboo to the family. They shun at all life insurance agents and discourage their men not to buy this superstitious product. It takes a lot of pain and effort for our professional agents to make them understand that life insurance is actually a love program for the family. In my many years of selling life insurance, i have not seen any mother or wife who refuses to accept the claims when something unpleasant happened to their sons or husbands. Whenever the children or husbands were critically sick, they appeal to us for speedy payment of those medical payments. Death is unavoidable, be it the young or old. Each time when a client of mine passed away, i could sense the important of cash was urgently needed. One person could have died, the survivors of the family would still have to continue to live. In my recent death claim of a son, the mother who received the full payment of the cheque was crying with emotion. I could not help to save her loving son but i made her life more easier to live with the cash provided from the life insurance bought through her son. Yes! She was sad for the lost of her beloved but she was happy because the money brought her hope. A hope of love from the lost son who cared. 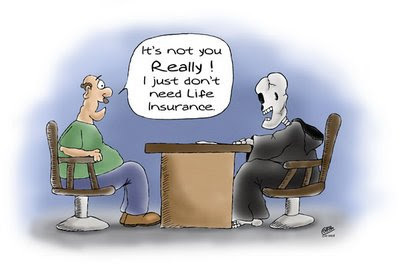 To those mothers and wives who said "I don't need life insurance", we have to try harder to make them realized that they actually need life insurance more than anything else, especially when lives are so uncertain and unpredictable. Believe me, i have plenty of testimonials and true stories to convince them. Something to ponder - "There are worse things in life than death. Have you ever spent an evening with an insurance salesman?" - Woody Allen quotes.